While digging around for a few facts about this wonderful root vegetable, I discovered that although it is grown throughout Africa, Nigeria is actually the world's largest producer and exporter of yam, responsible for over 70 percent of the world total output. For some reason, this makes me extremely proud and I'm not exactly sure why. And while I'm on the topic of weird sensations, I guess this would be as good a time as any to admit that one of my guilty pleasures in life is sneaking a bit of cold yam from the pot long after the end of the meal and munching my way through a thick chunk of the stuff. Again, not exactly sure why. I've kept this recipe pretty basic but it's delicious to boot. 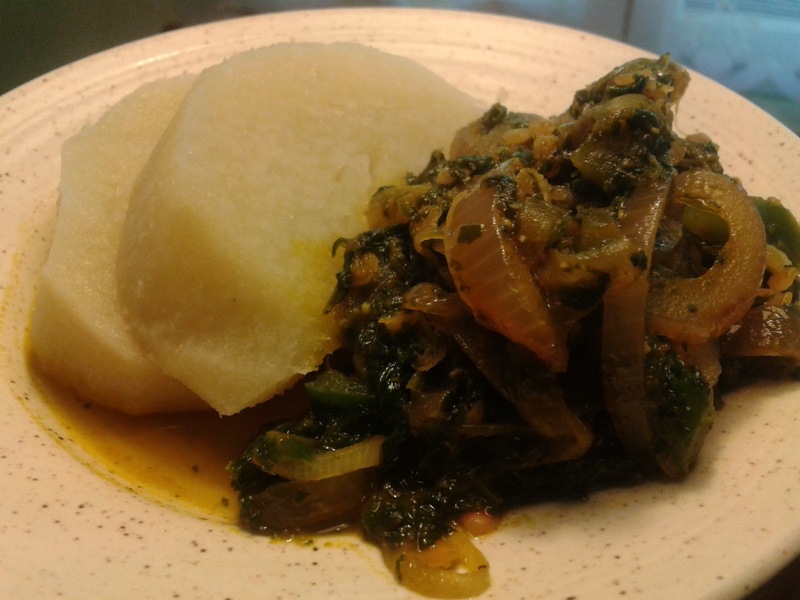 The mild taste of the yam soaks up the intense flavours of the spinach sauce. It's fresh and moreish all at once. Start by boiling the yam in lightly salted water until soft (but not mushy!). To make the spinach sauce, sautée the red onions in oil for 5 minutes before adding the spinach. Sautée for a further 5 minutes then cover with half a cup of water. Add the cooked beans or lentils, chopped green pepper, stock cube, chilli powder and salt to taste. Leave uncovered and simmer for 15-20 minutes or until most of the water has evaporated. Serve the yam and spinach hot. Enjoy! I love the inclusion of lentils or beans... maybe aduki beans? or red lentils? hmmm.. sounds yum and very healthy. On another note dont you think that spinach is cooked for tooo long? it'll loose it nutritional value. Yes, I used red lentils here and it cooked pretty quickly so if you use azuki beans be sure that it is pre-cooked. Nothing like uncooked beans to ruin a good meal! Interesting point about the spinach. My unofficial theory is that all the nutrients are locked into the sauce. Haha. But honestly, the cooking time was as long as it was to give the lentils a chance to cook and to create an intense, concentrated sauce. If you're using cooked beans then do feel free to cook for a shorter time. The shorter the better!